Energy Suspension Body Mount Bushings provide a better ride than rubber bushings. These quality bushings are constructed from high-performance polyurethane and are proven to last longer than rubber bushings, and are more comfortable than metal bushings. 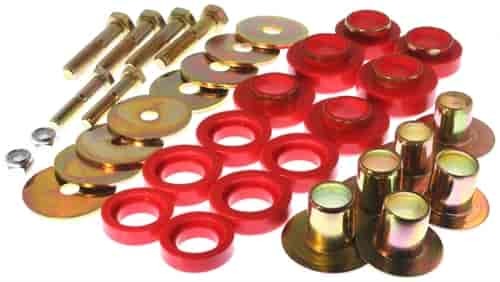 Using complete kits to replace your body mount bushings will also restore the ride height of your vehicle. Does Energy Suspension 3-4142R fit your vehicle? 3-4142R is rated 4.5 out of 5 by 2. Rated 4 out of 5 by Keller Kustoms from Body Bushings Received bushing kit and was impressed with quality and accuracy of fit. Thanks guys. Also was impressed with the fair price.